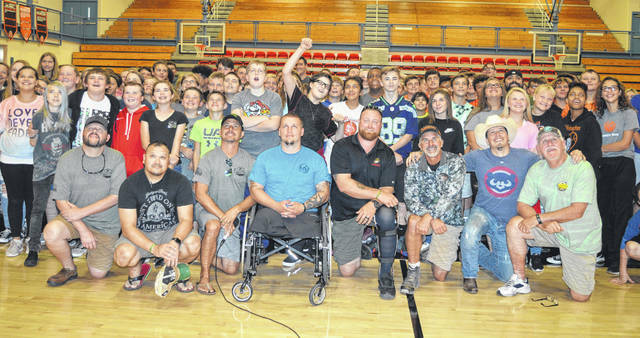 Veterans and participants in this week’s Operation Cherrybend events visited with eighth-grade students at the Wilmington Middle School gym on Friday afternoon. After the program, Operation Cherrybend participants posed for a photo with their audience, many of whom are out of view. Earlier in the day, the veterans enjoyed (we presume) tandem skydiving, after two days of hunting, fishing and other activities. Operation Cherrybend culminates with the annual concert Saturday night at the Murphy Theatre featuring Mark Chesnutt and veterans/singers Jared Ashley and Jason Michael Carroll. For more photos from Operation Cherrybend, see inside today’s News Journal.